The Government announced this week that it’s banning (‘proscribing’) National Action: a horrific neo-Nazi group that has held protests around the country with banners saying ‘Hitler was right’. So far, these protests have taken place primarily in northern cities, with no sign of any in London. 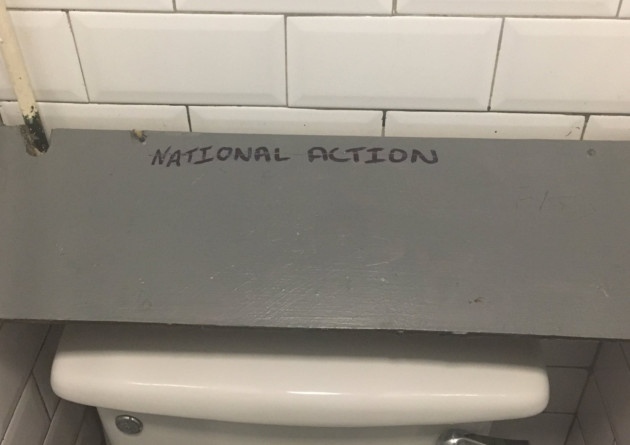 A few weeks, however, I was in the Garden Gate on South End Green and noticed that the words ‘National Action’ had been scrawled in the men’s toilets. I was, needless to say, shocked to see this in our community. Although the words by themselves don’t mean much to most people, it is a sign that these scumbags have some kind of presence in North London. It is also sadly not the first time I’ve had to report neo-Nazi graffiti this year. I reported this to the pub management, who could not reacted better. Understanding, quick to remove the graffiti, co-operative and open to using CCTV to identify the perpetrator, and keen to ensure fascists don’t feel welcome in our community. I commend their action and community-mindedness. It’s important to take a strong stance against anti-Semitism and fascism, as I know Hampstead residents and businesses do. Hopefully, the government’s action in banning National Action will raise awareness of the threat of virulent, violent anti-Semitism. Hatred of the Jewish people is often, sadly, found bubbling under the surface of society, as we’ve seen in the rise of the ‘alt-right’ – a euphemism often used by neo-Nazis – especially in the wake of Trump’s victory in the US. My colleague Cllr Stephen Stark has done great work with the police, council officers, and Camden’s Jewish community to keep them safe. We need a zero-tolerance approach and swift, stern action to tackle hate in whatever form it’s found. Update: This has been covered in the Ham & High. For more about my campaign to keep our streets safe, click here.